Classic Monsters Dracula (1931) Ultimate Guide - the Lugosi classic! MyMovieMonsters.com > Monster Magazine Marketplace > Classic Monsters Of The Movies (UK) > Ultimate Guides > Classic Monsters Dracula (1931) Ultimate Guide - the Lugosi classic! 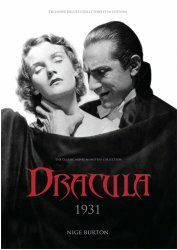 Direct to MyMovieMonsters.com from the creators of Classic Monsters of the Movies magazine in the United Kingdom: The Dracula 1931 Ultimate Guide evokes the brochure you might have bought at the cinema in 1931! It is a luxury magazine dedicated to the James Whale classic. We ship same or next day so don't wait for the UK! Details of its transition from Bram Stoker's book, to the stage, and finally to the screen. Overview of the impact the movie has had on popular culture. Thorough study of the life of Bela Lugosi. Fascinating biographies of the major cast and crew, providing an insight into their oftentimes tragic personal and professional lives. A look at some of the popular memorabilia inspired by the film, and a wealth of trivia and little-known facts. Tons of high-quality stills, posters, press books and artwork. Plus much more! Classic Monsters founder, author and horror film historian Nige Burton has dug deep into his crypt to unearth the compelling story of the making of what, by many, is considered the first proper horror movie. If you are a fan of the Universal classic monsters, then this unique tribute to this horror great is most definitely for your collection. It's the perfect reference guide for any fan of Bela Lugosi's most iconic performance. Want this Ultimate Guide as well as the Bela Lugosi: Prince of Darkness Guide? Use the handy Buy Both button below!